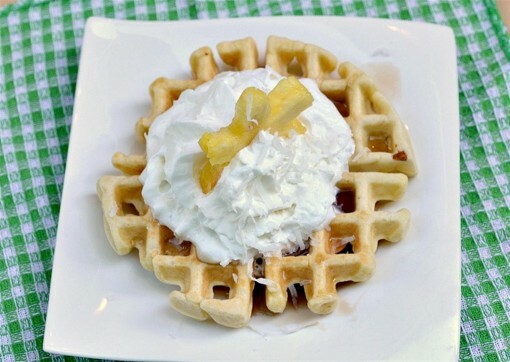 Coconut Waffles for One was posted on May 23rd, 2012 and is filed under Breakfast, Dairy Free, Recipes, Vegan. This entry has 7 comments. You can follow any responses through the RSS 2.0 Comment Feed. Hi friends of Colourful Palate! I’m happy Charissa invited me to post over, I’ve been a fan of her blog for a while! Today, I’m sharing one of my all time favorite recipes. 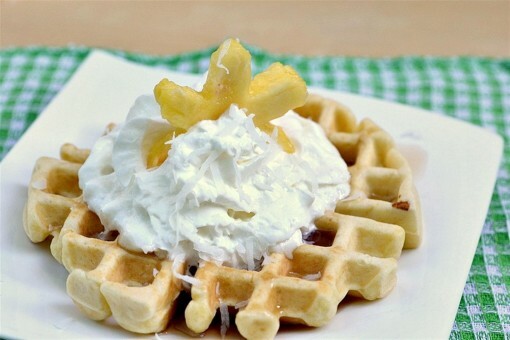 It’s super easy, incredibly delicious and low in fat, coconut waffles for one! As you can see in the below photo, I topped mine with a heaping helping of fat-free whipped cream and a pineapple shaped like a star. What’s more tropical than that? This recipe makes just enough delicious waffle for one hungry person, which is perfect for me because I seriously struggle with portion control issues. If there were more than just one of these divine, soft and fluffy waffles, I’m pretty sure I’d eat them. Despite being full. Yep, I have a problem. It’s called being a foodie. Another reason for the creation of just one waffle is simple, my hubby is deathly allergic. So, makes portion control a breeze and keeps him alive. Win win! I’ve made this recipe a few times and whenever I do, I tell him I’m making the “lethal tropic one.” I think I’ve ever referred to them on my own blog as that. But, unless you have an allergy, this waffle won’t kill just. In a small bowl, mix flour, baking powder, salt and sugar together. In another bowl, mix the coconut milk, regular milk, egg, vanilla and applesauce. Add wet mixture to the dry mixture and stir well. Add in 1/2 the shredded coconut. Pour mixture into a preheated waffle maker and cook for about 5 minutes, or until golden on both sides. Top with syrup, whipped topping and tropical fruit and enjoy! Note from Charissa: I was so blessed that Claire would do a guest post for me…she is one busy gal! I’ve loved her site for a long time…but I think it was her tweets I noticed first…she tweets good stuff! Anyway, you all should check our her site and try out some of her outstanding recipes…her Chobani Mac and Cheese has totally got my attention! Thank you Claire for taking time out of your busy schedule to post this amazing looking recipe! Also, this is the last guest post! I just got home from my trip…so I’ll be back to posting on Friday! And the winner for the Shabby Apple giveaway will be announced then….but you still have time to enter it! Oh, this is such a simple and gorgeous recipe. And I <3 the pineapple shaped like a star. This is PERFECT because: my husband doesn’t like coconut and he’s deploying very soon, so I’m going to be eating for one for waaaaaay too long, and I hate making a full batch of waffles only to have them go to waste. SO excited to try this. Personal size recipes are the best. That waffle is so pretty, too. Oh, and BTW Claire, I checked out your website and was surprised to see you live fairly close. I’m in Maryland. What a way to have an exotic breakfast…Love to try this the soonest! That is a yum-tastic looking recipe! I need more breakfast options! I was craving a waffle and googled recipe for one person. I found your coconut waffle recipe. I made the following changes- left out the coconut milk, skim milk, applesauce. Instead I used 3/4 of a 5.3 oz. Yoplait Greek 100 calorie coconut yogurt. The shredded coconut wasn’t explained how to distribute it. So I took 1/2 of the 1/4 cup and put in with the flour. The result was a fluffy golden-brown wonderfully coconut-flavored waffle. In a couple of weeks, we’re going on a trip where there will be a kitchenette. I’ll probably make these wonderful waffles down there. Thanks so much for posting this. Yummy!